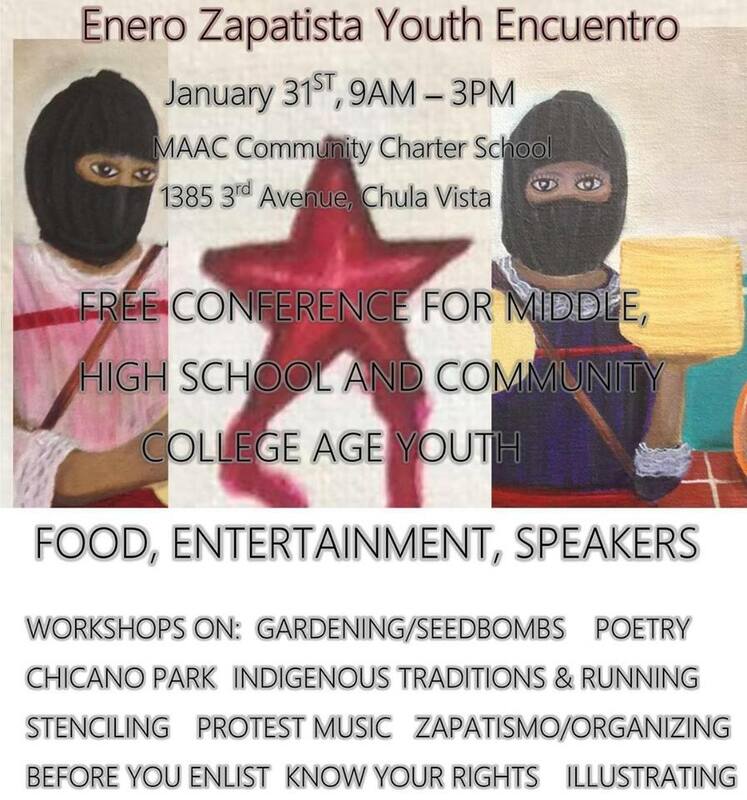 On Saturday, January 31, MAAC Community Charter School will be hosting the Enero Zapatista Youth Encuentro, a free popular education conference for middle school, high school and community college age youth. There will be workshops led by local and out-of-town facilitators on a diverse range of topics relating to self-determination, Zapatismo and defending human rights, as well as a speakers, entertainment and food (adults are kindly requested to sponsor a youth by donating $5 for their vegetarian catered lunch). The Youth Encuentro is part of Enero Zapatista, a month-long series of politically and culturally conscious events in San Diego that commemorate the uprising of the Zapatistas in January 1994. It is organized by community groups and individuals and is currently in its eleventh year. We seek to continue the lucha/fight locally, globally, and glocally, always growing and reflecting towards “a world in which many worlds fit”! The MAAC Community Charter School (MCCS) has spent the past 13 years aiming to meet the needs of “at-promise” students who have been marginalized or pushed out of traditional high schools. MCCS uses critical pedagogy, the arts, restorative justice and multiple youth development opportunities to engage non-traditional learners and support them in taking ownership of their educational path. Know Your Rights with the Police and ICE by ACLU GO!